Soukhouen tells me to step only where he does and I don’t need to be told twice. The land mines on either side of the trail are content to wait, knowing sooner or later they will claim another victim. Steam, rising from the morning dew under a blistering sun blankets everything in an eerie, horror movie fog, crawling across the jungle floor before it begins to climb the tumbled granite blocks that have witnessed two thousand years of war. 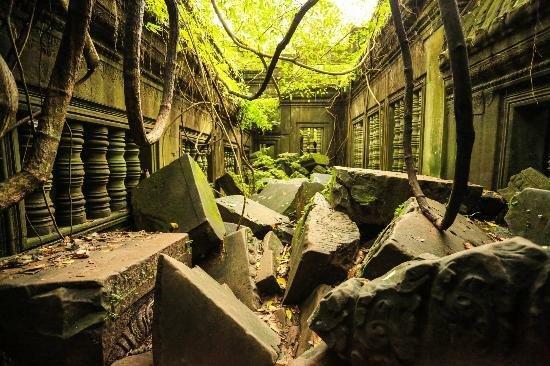 The scattered temple of Beng Mealea is the ancient soul of Cambodia, a silent monolith of memories in the clinging grasp of a predatory jungle, and thirty years after the last bullet was fired in anger it is still saturated with land mines. This is our first stop on a journey through time to follow a story about persecution, degradation, and ultimately, perseverance and renewal. In this country where approximately 17% of the population follows the religious path, the history of Theravada Buddhism is intertwined with that of the nation. It is the veins and arteries that pump the lifeblood through a war-torn nation that has become buried by poverty, and it is the story of those who wear the saffron robes — one of the most epic survival tales in history. Soukhouen, unlike most Khmer men, had not spent time as a monk, but knew their true stories could only be found deep in the jungle at isolated villages and temples where the survivors of the last great horror have chosen to end their physical days away from the distractions of their fellow man. Why the Khmer empire vanished no one knows for sure, but war has a way of wearing civilizations down, and my bootprints follow those of countless armies who have bled into this land; but always, in the end, the jungle returns to hide the sins of mankind. At Beng Mealea, it is so quiet that personal imagination supplies the soundtrack of human conflict. At this killing field, the cries of lost souls are deafening. It has suffered invasions from China, Thailand, France, America and Vietnam, while the entire history and mythology of a people, carved in stone, standing silent watch, has borne witness to it all. During all of these wars, monks were an easy and logical target and they died in droves, but it was only during this lifetime that they came from the edge of extinction. The ruins of Beng Mealea are a mere sixty-five kilometers east, but a thousand years removed from Siem Reap — the once quiet village that is now the neon capitol of Cambodian towns and the gateway to trashy tourist stalls that infect Angkor Wat. While Angkor sits atop the tourist heap with millions of annual visitors, Beng Mealea is known only to those intrepid few who venture far off the beaten path. It is a window into a vanished culture that in its day produced some of the finest artisans the world had known and a flourishing civilization that raised magnificent cities while that of my own country was living in nomadic shelters. 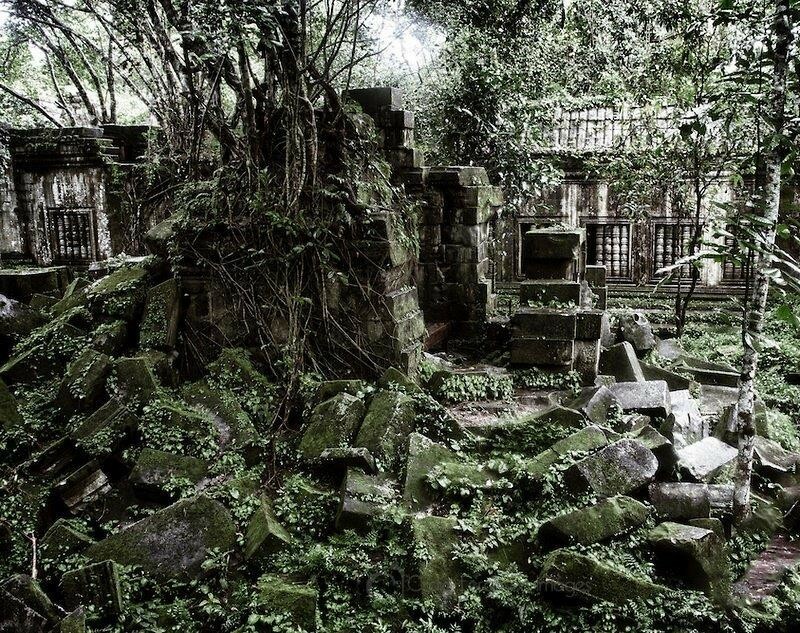 For centuries, Beng Mealea has only given up its past in bits and pieces. It is the least visited and least explored temple in the nation. The Khmer people avoid it, thinking it a spirit land of lost souls. In a country where one out of six Cambodians is a victim of a land mine, Beng Mealea has claimed more than its share. There are no plans to restore it because there is simply no money, but for this I am grateful, because to me she is a far more attractive ruin with all the years upon her. Initiated in the late 11th century and completed early in the 12th, Beng Mealea predates its showier cousin by over a century and is believed to be the model upon which the main temples of Angkor were modeled. Satellite imagery has revealed a wagon wheel of roads emanate from its center in all directions, proving it once linked the entire Khmer empire and stood as the hub of its activity. Its lush jungle has tasted the blood of soldiers from six nations while knowing only forty years of real peace in the past two millennia. During the “American” war, in jungles too thick for infantry, ground-penetrating land mines were carpet dropped over hundreds of miles, and now here I am, four decades later, trying not to step on one. The drive there, although short, is brutal. The road is punctuated by old artillery strikes and countless military checkpoints, some authentic, some freelance, but all are lined with heavily armed men who demand money that will go directly into the pockets of local generals. These are the same men who were once lieutenants under Pol Pot and the Khmer Rouge. They still run the country, the only difference is that now they wear fancier uniforms. Bouncing over potholes and waiting for the shriek of snapping steel as our axle gives up the ghost, I am taken by the smoke from countless wood fires that blanket the forest, softening all the edges and filtering the velvety yellow morning sunlight, creating a false sense of peace and tranquility. We pass a car, an ancient Rambler sedan with no windows and apparently no engine. It is harnessed to a water buffalo with reins running back across the hood and into the cab where eight people ride, another four sit on the roof. It is a jungle taxi and the only vehicle we see all day. At one rickety guardhouse, a soldier with an aging AK47 demands US$2. I am out of singles and offer him a US$5 bill in hopes it may buy us some good will along with a pass. He holds it up to the light and tugs on it hard as though he would know counterfeit, and I stifle a smile when he leans his rifle against the car and reaches into his pocket to give me back US$3 in change that he pulls from a wad of dollars and euros. The road ends at a marshy bog that is imprinted by the large round feet of an adult elephant, which in turn, has left behind a steaming pile of dung for the flies. Another soldier takes a dollar to guard our car. I know I am paying him not to rob us, but he will probably do so anyway. One constant at these remote sites is the children. These are the leftovers of the slaughtered innocent, the detritus of war. Some are second generation, homeless born and bred, but still orphans without any skills, education, or hope of getting either. They linger near the temple entrances in hopes of preying on the guilt of visiting tourists for a few coins. Some hold photos of long-dead relatives. They are a sad fact of life in Cambodia; too numerous to help, and too pitiful to ignore. Their skeletal appearance reveals the small number of visitors they receive, and I distribute my day’s supply of beef jerky among them, like adding a drop of water to the ocean. The trail takes us past a seven-headed Nāga, the ubiquitous temple guardian of a giant multi-headed cobra that flanks the main pathway. This one has been shot to pieces and try as I might, I am unable to pry even a single ageing bullet out from its bullet hole. We pass massive webs with spiders that are larger than my fist. The morning dew still clings to their webs, catching sparks of sunlight through the jungle canopy and sending prisms dancing on the occasional breeze. I stop to wonder why battlefields always seem so beautiful to me. When the path disappears into bush and Soukhouen starts to swing his machete, I grab his belt, walking close enough behind him to plant my feet only where his have gone. I flinch at the snap of every twig. After a few yards he leans against a banyan tree and tells me he had been at this very spot only one month prior while on a picnic with his wife and small son. He felt something poking him in the rear that turned out to be an anti-tank mine. Luckily, he did not weigh enough to detonate it. The tree is in the middle of the current safe zone. He says this with a small laugh as only one who lives this close to death can. I know and trust Soukhouen because he had brought me here last year to photograph the ruins. While I was standing in the central courtyard atop a jumbled pile of granite blocks, I had dropped my camera’s memory card and watched it slide into the black depths of a maze made by ancient granite blocks and sleeping cobras. With my heart stopped, Soukhouen went into action, and without me hearing or seeing anything, people had began to materialize from the jungle. Somehow, he had called them through the silent jungle telegraph that only animals and those who dwell within can hear. They had gathered to help me, a stranger they would never see again. They had come simply because they were asked to. The women burned incense and chanted, invoking Buddha, while the men shouldered giant stone blocks under a blazing sun, sliding them inches at a time, moving tons of rock with nothing but sinewy arms and legs, while I prayed that two weeks’ worth of photos would return to me. They had labored for hours, and in the end, could not retrieve my card, but by that time I no longer cared. I had been given a far more valuable gift. I had watched these amazing people labor all day in brutal heat and humidity. None of them knew what a memory card was and it did not matter anyway. They came for no other reason than a stranger needed help, and they expected nothing in return. This is the spirit of Beng Mealea. It is people like those who came to my rescue that day that make a civilization great, and in that moment, the nature of Buddhism had been revealed to me. I realized I was not meant to retrieve the card. It had become a time capsule, it waited for some distant date in the future to give up its secrets, while I was but a spectator of this great drama. Instant karma. A hand on my arm brings me out of my reverie and nostalgia. An old man has appeared at my side. He is just there, like a spirit with a wispy beard. He takes my arm as I descend, and although he is holding me up, his touch is as light as an implication. At first I think he wants money, but Soukhouen reminds me it was this same man who came to my aid almost a year ago to the day; he had tried to help me find the memory card. He is beaming at me through a single-toothed smile that is the color of betel nut, happy that I remembered him. I think back to when we first met, and how he had bowed and offered me the clasped-hand Khmer greeting, refusing my money while telling Soukhouen he had lost face for not having retrieved my memory card, and before I had a chance to say a word, he had turned and disappeared into the jungle. I had thought about this man throughout that night and many more since then, wondering if I could ever be as good of a person. I have returned because of that memory card. Not just to reshoot the lost images but to relive those perfect moments of mankind at its humble best. The old man is still with me, and he will not leave my side, determined to see I do not experience another mishap while on his watch. He leads me over the jumbled stones, pointing to where I should step while spitting long streams of betel nut juice onto the ground. Soukhouen has gone off to pray, and I am alone with the old man, who I accept as a type of silent guardian angel. We have no common words with which to communicate, but none are needed. When I look at him he smiles, and my day becomes as good as it gets. I move stealthily through the tangled puzzle of rock and jungle, willing there to be no cobras. Wherever I look, a photo presents itself and all I have to do is activate the shutter. At the end of the day, the wonder of Beng Mealea lies safely within my camera once again. I have regained all the photos I had lost, and much more. Half of me wants to tell the world about this place, but the other half wants it to stay hidden. I sit on a tree root sorting through money, trying to decide a fit reward to give the old man for this wonderful day, but when I look up, I see his back disappearing into the undergrowth. He took no money then, and he will take none now. He has come into my life at two critical moments and disappeared soon after, a phantom I could not have created for a fictional story. I feel a life bond with him and he has hardened my belief that at certain times in our lives a cosmic plan will come into play, regardless of what we believe or do. This article is an excerpt from James Dorsey’s book, “Vanishing Tales from Ancient Trails”.